The government’s definition of a pupil with EAL is anyone who has been exposed to a language other than English during early childhood and “continues to be exposed to this language in the home or the community”. Diverse in background: they may be UK-born, or recently arrived in the UK due to personal and professional choice or desperate circumstances. Diverse in English language proficiency: they may be new to English, use English as a main language but not yet at age expected proficiency, or fluent bi/multilingual in English and other language/s. Diverse in educational background: they may have experienced interrupted or no schooling, only the UK school system, or consistent schooling via a different curriculum. Diverse in their literacy: they may be familiar with the Latin-based alphabet/script, or may be literate in a non-Latin based alphabet/script or not literate at all. Evidence demonstrates that bilingualism has both cognitive benefits and offers professional advantages in a globalised world. A recent report analysing data related to the achievement of EAL learners highlights the crucial importance of proficiency in English as the best predictor of educational outcomes (University of Oxford, October 2018). The same report urges schools to assess and record the proficiency in English of their EAL learners. Using an evidence-informed assessment framework, such as The Bell Foundation’s EAL Assessment Framework for Schools (free to download), will support teachers in understanding and identifying the specific English language needs of their EAL learners. The framework is easy to use and is designed for practitioners to assess language within the context of the curriculum and arrive at a best fit judgement of a learner’s English proficiency band – from A (New to English) to E (Fluent). The band descriptors can also be used as targets. The framework has accompanying practical support strategies and resource recommendations for each level of proficiency. There is plenty that teachers and support staff are already doing (or can do) in the classroom to meet the differing needs of their EAL learners and help them achieve at and above age-related expectations. The following strategies for teachers and teaching assistants in the classroom are pitched at Band C of English proficiency, the band that is often quick to reach but takes time to move on from. Many of the strategies will benefit all pupils, as it is not only EAL learners who need support in developing the language needed to access the curriculum. Place the EAL learner in pairs or groups with supportive pupils who are language role-models. This is crucial for developing language and facilitating friendships that will foster language development outside the classroom. Make available and encourage learners to use an age-appropriate English dictionary and thesaurus (including online dictionaries for English language learners – such as Cambridge Learner’s Dictionary – for clear definitions, pronunciation, and translation). Provide teaching assistants with support and clear guidance on how to support EAL learners (see The Bell Foundation website for further guidance). Provide a bilingual dictionary – age-appropriate and pictorial (for examples see the Mantra Lingua website). Ensure that there are plenty of motivating books available at the level of the EAL learners in the classroom and focus on reading for meaning. Give EAL learners thinking time (as they need to process what they hear and what they say). Speak/read aloud clearly, making sure EAL learners can see the teacher/teaching assistant’s face, and avoid idiomatic language (e.g. “this should be a doddle”) that may be hard to understand. Use gestures, mimes, exaggerated facial expressions. Target EAL learners for daily questions, differentiated according to their language level (e.g. for a year 6 Band C EAL learner, instead of “What kind of climate did they have in Ancient Greece?” say “What was the weather like in Ancient Greece?”). Recast errors (“She runned home...” “So, she ran home...”) and encourage extended utterances through prompting for more information. Provide scaffolded dialogue opportunities in group work using Directed Activities Related to Text (DARTs), such as role-play, hot-seating, sequencing and matching activities. Barrier games in pair work are also good for generating dialogue and checking understanding (see further information). Teacher/teaching assistant to have Who, What, Where, When question words to hand (on cards) to support questioning and related activities. Repeatedly check understanding of topic, basic learning intentions and what to do in a task. When talking, insert synonyms/simple alternatives during whole-class teaching to clarify meaning (e.g. “He is determined to reach the river – he wants to go to the river so that he can warn – tell – the others). Scaffold speech and writing using gap-fills, speaking and writing frames and other graphic organisers (see further information). Scaffold speech and writing using substitution tables to reinforce language structures and check understanding (see further information). Teacher/teaching assistant to have a mini-whiteboard to hand to create quick visuals, choices (e.g. liquid or solid?) or to reinforce key words, clarify and rehearse maths operations. Use concrete visual support such as story props, objects, 3D shapes. Use visual word banks (create them quickly and easily using software such as Communicate in Print, or see the EAL Nexus resource website for ready-made curriculum-related visuals). Print slides with visuals from the whole-class display screen/whiteboard so the learner can stick them in their book (to refer back to, label, etc). Use Dictogloss as a way of modelling text construction and language structures. It is good for the whole class and helps support the development of academic language (see further information). Use Google translate. Show learners how the speaker button works, and encourage them to do the same. Google translate, while useful has shortcomings, so take care. Clearly model and frequently repeat new vocabulary and language structures. Include topic-specific/genre-related vocabulary and language structures in planning. There are many examples of planning for language on the EAL Nexus website. See table below for an example. Teach vocabulary and language structures in small groups of two to six pupils (see further information). Consider using a whole-school approach for developing vocabulary (such as Word Aware, written by speech and language therapists). Teach and check understanding of the language involved in maths problem-solving (commonly used words/phrases, e.g. altogether, each, the same, as many as possible). Teach and check understanding of the different words for the same maths operation (e.g. minus, take away, subtract). Provide learners with maths vocabulary (search online for EAL maths vocabulary or use Twinkl for maths vocabulary cards/mats in English and other languages, e.g. Polish, Romanian, Arabic). Acknowledge participation and efforts to reproduce knowledge and language structures related to the curriculum. Include marking for understanding and knowledge of the curriculum, through content, regardless of grammar, punctuation and spelling (GPS) errors. Include marking for appropriate/inappropriate language – sometimes the grammar may be correct but the context inappropriate (e.g. using a command when requesting something politely). Correct and write clear examples of one particular language structure for the learner to practise (see further information). Use the Speaking, Listening, Reading, Writing descriptors in the EAL Assessment Framework for Schools to set targets. Parents of both EAL and non-EAL pupils who are confident in English and understand the English school system have an advantage over parents who have limited English and are unfamiliar with the curriculum and system. 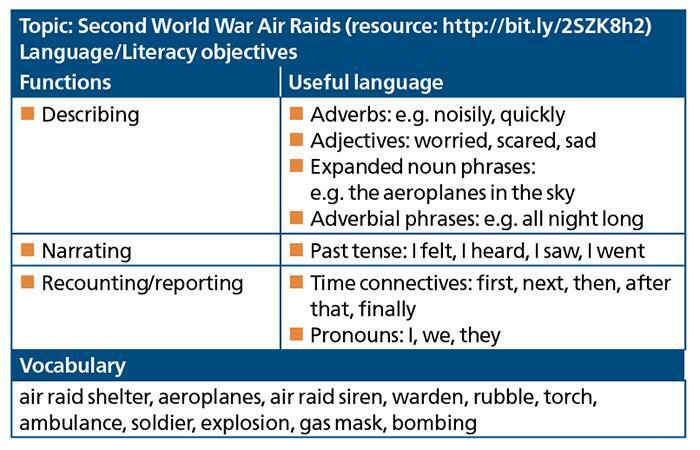 Communicating effectively with home, as outlined below, is key to improving the outcomes of EAL learners. Ensure the learner understands what to do for homework. Make class letters/school information accessible through the use of clear language and short sentences. Use multilingual staff to interpret if necessary. Regularly remind parents of current curriculum topics and encourage them to discuss and research the topics at home in their first language. Give parents useful websites on curriculum topics and homework (including links on the school website), particularly if homework involves internet research. Recommend the learner opts for the Simple English Wikipedia as opposed to the standard Wikipedia. Target and encourage parents of EAL learners to attend parent workshops and meetings – use multilingual staff to interpret where possible. Recommend the free website Learn English Kids for the learner to use at home. In addition to EAL training provided by EAL specialists, embed short, regular, in-school training into the calendar. Even if there is no specialist EAL coordinator, schools can run EAL workshops. For example, a one-hour staff training could comprise 30 minutes of teachers sharing good EAL/language development practice (including how they use support staff for EAL learners) and 30 minutes exploring practical resources on websites such as EAL Nexus and Twinkl’s EAL section. Emma Parsons is an associate at The Bell Foundation and a former primary school deputy headteacher.